Help A Reporter Out (HARO), the uber-simple brainchild of hyper-active, skydiving, PR wild child Peter Shankman has gone big-time. Born humbly as a simple way for reporters to connect with potential sources, HARO has grown to more than 50,000 participating reporters, with 150,000 people receiving three daily emails stuffed with requests for sources. Not surprisingly, HARO started groaning at the seams a while ago, as the sheer volume of reporter requests in each email made it virtually impossible to scan. Evidently, there was a four month wait to advertise in the HARO email, too (which reportedly gets a mind boggling 75%+ open rate). If you’re a masochist, or a PR person that has clients in a ton of different industries, you can continue to receive the full version of the HARO emails. But most people will very much appreciate the ability to receive industry-specific versions containing inquiries germane only to their area of expertise. This should make each edition of HARO much shorter and easier to browse, saving time and increasing relevancy dramatically. Go to the nifty new Web site and create an account to set your customization options. Taking a page from Craig’s List, HARO is now anonymizing reporters’ email addresses, so they cannot be spammed by unscrupulous types that were deploying harvesting scripts to surreptitiously gather all the email addresses. That should increase journalists’ confidence in HARO, and boost participation even more. HARO is trying to move much of the interaction between reporters and sources away from ad hoc emails, toward a Web-based protocol. This creates less email volume for reporters, and gives HARO the ability to better track results. 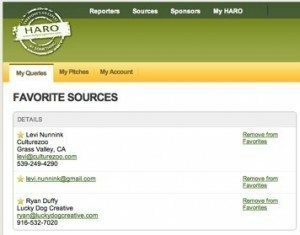 While this takes a bit more effort because you have to go to the site and log-in, it’s advantageous for both reporter and source because HARO is storing your previous queries and pitches. Thus, you can log-in and see all the reporters you’ve contacted. For journalists, the news is even better, as they can now store their favorite HARO sources on the site, and can rate pitches in real-time. Thus, if you pitch a reporter via HARO, and your pitch was off-base, the reporter can give you a virtual thumbs up or down, and some sense of where you went astray. Hopefully, reporters will use this feature, because as HARO has grown the number of pitches you send that get no response whatsoever from reporters has increased – and that’s frustrating. While you lose a bit of the transparency and ease-of-use that were hallmarks of the original, organic HARO, this new version has much-need personalization and account management functionality that should enable this indispensable, post-modern journalism bazaar humming for a while. What do you think of the new HARO? How much do you use it?